Multicolored Clay is made in Izucar de Matamoros, Puebla which is the cradle of the popular Mexican Tree of Life sculptures; the candelabra and incense burners decorated with fine lines that almost look like filigree are the best known items in this pottery style. 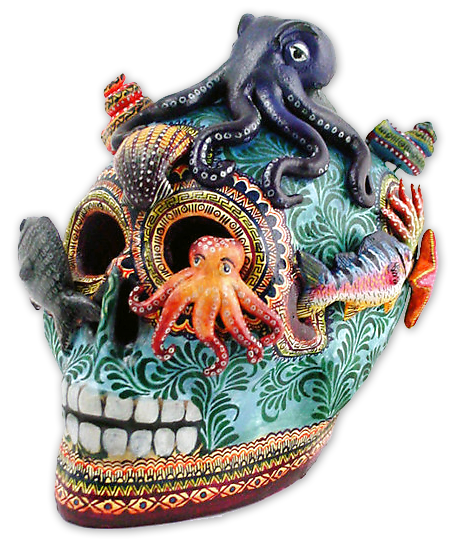 Other pieces made in the area with the same decorative style include whimsical skeletons performing different actions, assorted candlesticks and skulls decorated with flowers and animals. Izucar de Matamoros is located in a fertile valley in the southeast corner of Puebla State. Its pre-Hispanic name was Itzoacan which in Nahuatl means the place of the flint. The first known inhabitants of the area were the Olmecas; 2500 years old pottery remains have been found nearby. By the time of the Spaniards arrival Itzoacan was a large city populated by Mixtecos subjugated to the Aztecs to whom they paid a cotton tribute. It had a large market and was a crossroad between many commercial routes. Izucar was taken by the Spaniards early in the conquest and by 1521 it was given as an encomienda to Pedro de Alvarado. The Dominicans in charge of the town's evangelization founded a small church in 1528 and later, in 1552, Friar Juan de la Cruz began building the church and monastery of Santo Domingo de Guzman. The monastery was finished in 1612 and became the town's native people parish. The Spaniards had their own parochial church called Santa María de la Asunción. Izucar developed an active religious life encouraged by the foundation of the religious brotherhood of the Blessed Sacrament in 1652. The religious activities and ceremonies together with other costumes boost the evolution of town's ceramic from pots and tableware to candelabra and incense burners. The multicolored clay candelabra were used as a gift to newlyweds to ensure the couple would have many children and abundant harvests in their fields. Incense burners are still used in the brotherhood celebrations which revolve around a silver platter that symbolizes the host. This plate is kept in each of the 14 neighborhoods of Izucar for one year. Every month the plate is moved to one of the neighborhood houses selected to keep it. Every time the platter moves, a ceremony is held and the piece is purified with copal; the copal is burnt in a traditional incense burner and 12 incense burners are used during the year, one for each house where the plate is being guarded. The plate changes neighborhood on Saint Peter and Saint Paul Day (June 29) known in Izucar as the day of brotherhood celebration. The platter is then taken to the Santo Domingo church where a mass is held; afterwards it is taken to the next neighborhood. Once the plate is delivered in its new home a meal is offered. All the expenses of these celebrations are sponsored by the alms collected by the volunteers. These traditions are at least 350 years old but the candelabra and the incense burners were not as intricately shaped and decorated as we know them today. The Izucar's multicolored clay has evolved over the years and most of these changes happened in the second half of the past century. 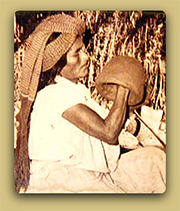 The first potter that helped to the style evolution was Aurelio Flores and therefore he is considered the father of multicolored clay from Izucar. Aurelio, grandson of potters, began working as a child helping his parents. 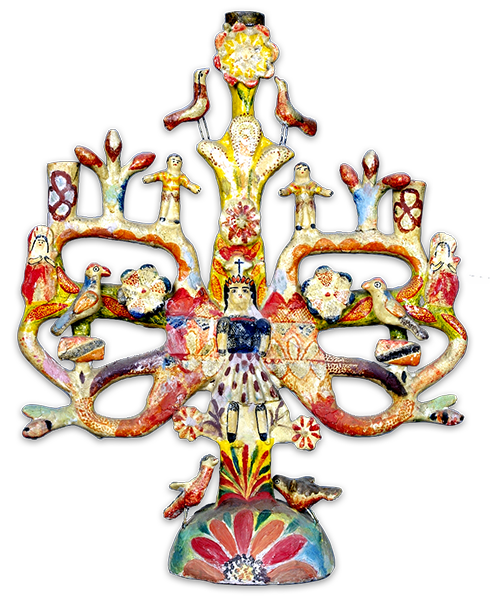 Born in the neighborhood of Santa Catarina Contla, Aurelio developed from the traditional candelabra and incence burners made for ceremonial purposes the sculpture known today as tree of life. His colorful sculptures were decorated with leaves, flowers and birds on their branches; Adam, Eve and the Serpent on their main trunk and the Archangel Gabriel at their base. For Aurelio pottery was a side job; he worked every day in his fields outside town, was a traditional healer and a musician. 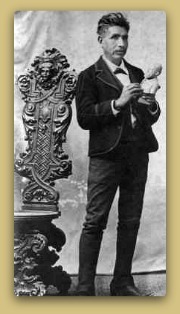 At first he sold his work locally but later merchants from Puebla City came to buy his art work that little by little became famous around the country. Aurelio Flores son, Francisco Flores Sanchez helped him from an early age and after his passing continued making the famous sculptures in the same style which is considered now the traditional multicolored clay from Izucar. Francisco inherited his father's farm and the talent for music; he worked in the farm every day and was part of a Mariachi band for many years. 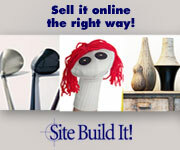 He passed away in 2006; his children did not continue the family's pottery tradition. The Castillo are an extended family of potters living in the Izucar's neighborhood of San Martin Huaquechula that began working in the 1960's and developed a new style based on the decoration of the pottery with fine lines that almost look like filigree and introduced new themes as the Day of the Dead. The oldest son, Heriberto specializes in mermaids, woman figurines, trees of life and candlesticks distinct for the aged golden backgrounds behind very bold colors. Agustin is perhaps the less famous of the siblings nevertheless he makes quality pieces decorated with the family patterns. Isabel is recognized for her delicate painting and has traveled across the USA giving workshops and exhibiting her artwork. 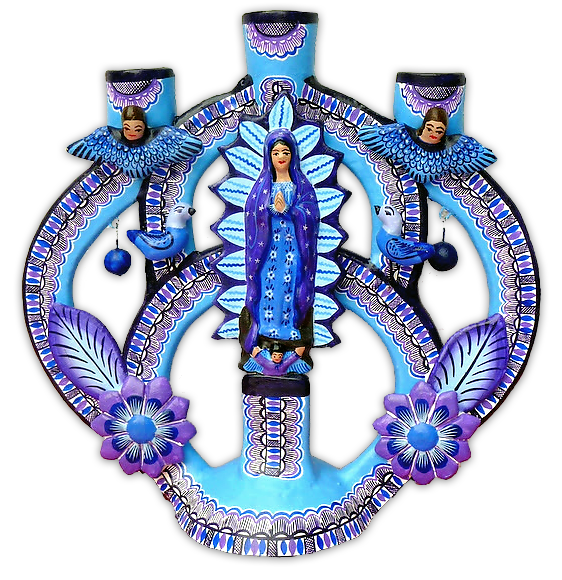 Among her notable pieces are trees of life, Day of the Dead candelabra and Virgin of Guadalupe themed pieces. 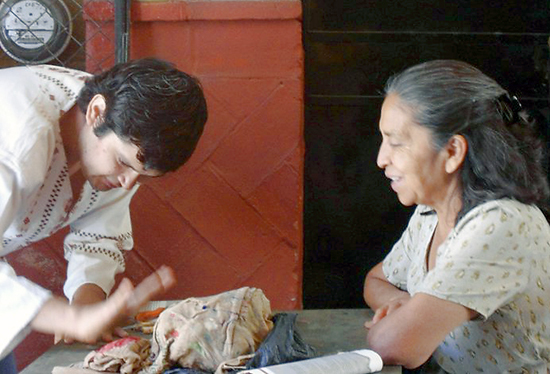 Isabel runs her workshop with the help of her children and grandchildren. Among them grandsons Gregorio and Giovanni Mercado Morgan have began making pieces on their own. 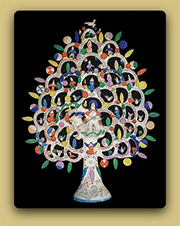 Their mother, Virginia Morgan Tepetla, makes trees of life, catrinas and Guadalupe Virgin figures. 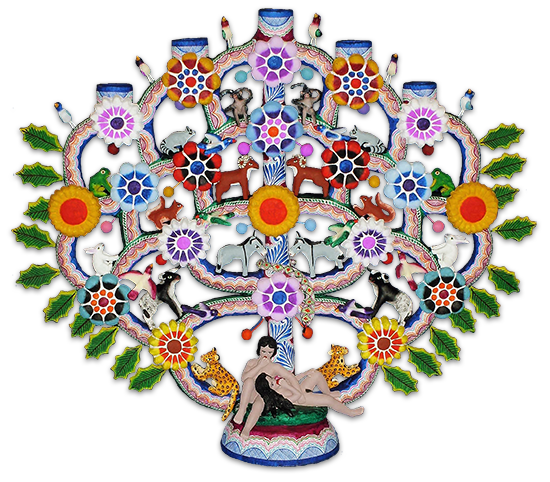 Considered a Master by the Banamex Foundation and winner of the 1996 National Prize of Folk Art Alfonso Castillo was the most prominent artist in Izucar. 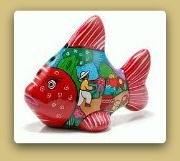 His domain of both clay sculpting and painting put his art work on a different level. His pieces have been collected by museums in Mexico, USA, Canada and Europe. Alfonso passed away in 2009 but his wife Marta and their children Veronica, Alfonso, Marco, Martha and Patricia Castillo Hernandez are still working. Maria Luisa Balbuena Palacios was married to Heriberto Castillo Orta and together they ran a workshop named Itzoacan until their marriage ended. 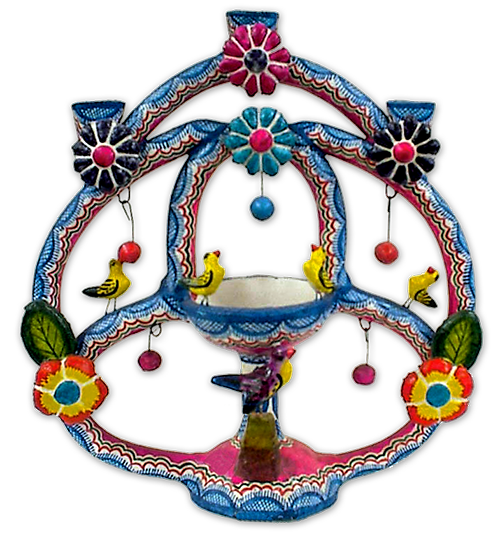 Maria then founded Casa Balbuena; she makes a great variety of pieces including large tree of life and miniature animal candle holders. Maria and Heriberto youngest sons, Jorge and Ulises Castillo Balbuena began working on their own in 2004 naming their workshop Arte CasBal and are for sure keeping up with their parents work. 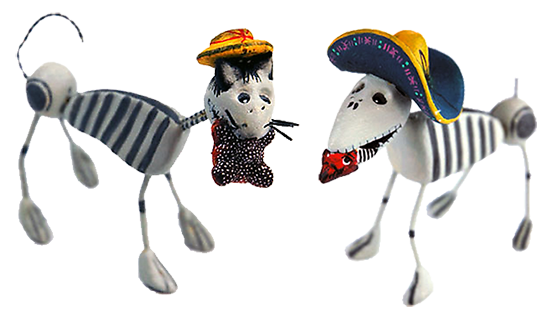 Tomas is the brother of Martha Hernandez, Alfonso Castillo's wife; he began working in their workshop and later became independent. 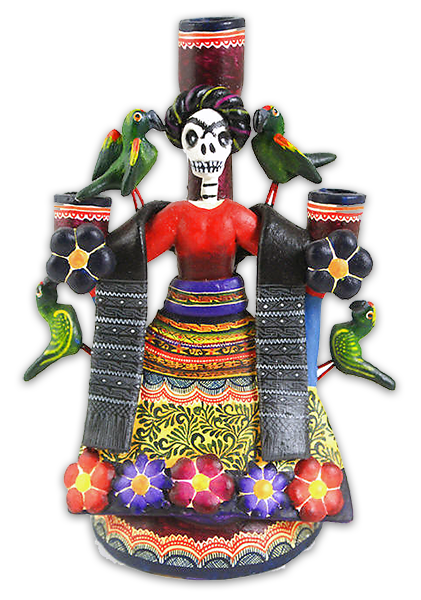 He is a very talented clay sculptor and his painting is fine and detailed; he developed his own style and specializes in Day of the Dead figures. Making a multicolored clay figure can take a few days or several weeks depending on the size and complexity of the piece. The clay which comes in clods is hit with a mallet until pulverized and afterwards sifted in a sieve until powdered. The leftovers are set in a water pond to rot for about a week. In a working table where the powdered clay has been arranged the mud that was previously sifted is added little by little mixing them both together. The mix is then cut in 8 pound balls and kneaded until it feels like dough. The balls of clay are stored covered with a wet cloth to prevent them from drying. The clay is then ready to be sculpted; most pieces are hand coiled with a few exceptions like flowers and leaves that are sometimes made with molds. When the sculptures are done they are left to dry which can take a few hours for a small piece or a few days for a larger one. Once dried the pieces are taken to the kiln where they will be fired for around 6 hours at 850°C (1560° Fahrenheit). The pieces are left to cool down in the kiln for about 16 hours; once out of the kiln they are polished to smooth their surface and painted with a coat of white acrylic painting. At last the pieces are ready to be decorated with the traditional bold colors and fine motifs that characterize the multicolored clay from Izucar. Acrylic paintings are the choice of every artist. After being decorated the piece is coated with furniture varnish to avoid the colors from fading.